As Donald Trump declared victory following the conclusion of special counsel Robert Mueller's investigation, Democrats showed no signs of backing down from the numerous legal questions encircling the president and his associates. The completion of the highly anticipated Mueller report, prompted an intense debate in Washington over how to proceed as Democrats said a summary of its findings by the attorney general, William Barr, "raises as many questions as it answers", even though it probably laid the issue of collusion with Russia firmly to rest. Since taking control of the House of Representatives in January, Democrats have launched an onslaught of investigations into the president, his administration and family business. It thus came as an undeniable blow to Democrats that Mueller's report did not find that the Trump campaign colluded with Moscow to swing the 2016 election, or produce a more definitive conclusion on whether the president himself engaged in any criminal activity. But as Trump and his allies seized on the account to falsely claim "total exoneration", Democrats signaled the legal and political battle lines were far from settled, especially when it came to Barr's decision not to pursue the obstruction of justice issue. 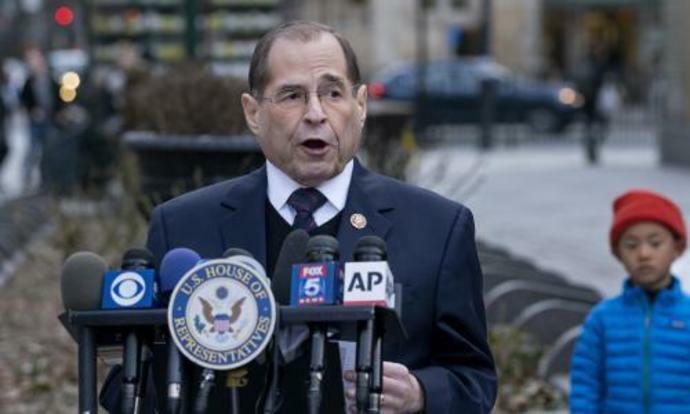 Jerrold Nadler, the chairman of the House judiciary committee, announced he would summon Barr, who was confirmed as Trump's attorney general earlier this year, to testify on Capitol Hill as Democrats seek more answers from the conclusion of the nearly two-year federal investigation into Russian interference in the 2016 presidential election. In a four-page letter to Congress, Barr said Mueller's report did not find criminal collusion between the Trump campaign and Moscow during the 2016 presidential election but was inconclusive on the question of whether the president obstructed justice. "It's a shame that our country has had to go through this," a defiant Trump said Sunday. "To be honest, it's a shame that your president has had to go through this." Democrats nonetheless demanded the release of the full Mueller report, while suggesting Barr's summary could not be trusted given his prior criticisms of the special counsel investigation. "The fact that special counsel Mueller's report does not exonerate the president on a charge as serious as obstruction of justice demonstrates how urgent it is that the full report and underlying documentation be made public without any further delay," the Democratic leaders Chuck Schumer and Nancy Pelosi said in a statement. "Given Mr Barr's public record of bias against the special counsel's inquiry, he is not a neutral observer and is not in a position to make objective determinations about the report." Democrats took particular issue with the claim by Barr and Rod Rosenstein, the deputy attorney general, that Mueller's evidence was insufficient to prove Trump had obstructed justice. The special counsel examined several actions by Trump in considering obstruction, including his firing of the former FBI director James Comey, public and private attempts to pressure the former attorney general Jeff Sessions, and role in misleading the public about a meeting between his campaign and a Russian lawyer during the campaign. In a joint statement, the Democratic chairmen of the House intelligence, judiciary and oversight committees called for the complete release of Mueller's report and "all underlying documents". "It is unacceptable that, after special counsel Mueller spent 22 months meticulously uncovering this evidence, Attorney General Barr made a decision not to charge the president in under 48 hours," the chairmen said. "The special counsel's report should be allowed to speak for itself," they added. But even as they seek a full accounting of Mueller's investigation, Democrats have sought to temper expectations of impeachment - a subject that has polarized the American public. The House speaker, Nancy Pelosi, has on multiple occasions thrown cold water on what several Democrats refer to as "the I-word", leaving it to voters at the 2020 ballot box to determine Trump's fate. Some strategists said the initial read of the Mueller report may have lifted the burden of impeachment from Democrats' shoulders, enabling them to focus instead on drawing a policy contrast to Trump as he seeks re-election next year. "I think Democrats need to allow the investigations to continue while focusing on the rest of their legislative agenda," said Jim Manley, a Democratic strategist who served as an aide to the former Senate majority leader Harry Reid. "It's pretty clear impeachment is not in the cards, at least not right now." To impeach Trump, Democrats would need not just a majority in the House but also a two-thirds vote in the Republican-led Senate to convict - an outcome now as unlikely as ever before given the widespread support Trump enjoys from members of his own party. There are countless other legal perils looming over Trump's presidency, however, that remain unresolved and which Democrats are likely to focus on. In public testimony on Capitol Hill last month, Trump's former personal attorney Michael Cohen directly implicated the president in the hush money payments - a violation of US campaign finance law - while also accusing Trump of various other criminal acts. "Reading the coverage today one would assume that the release of the Mueller report ended the criminal investigations into Trump his inauguration, his business, and his foundation," Dan Pfeiffer, a former senior adviser to Barack Obama, tweeted. "It didn't. He still has more criminal exposure than all the other presidents combined."